Exclusive: Tron (TRX) Launches DEX and IEO! Leave a Comment on Exclusive: Tron (TRX) Launches DEX and IEO! Coinstelegram is the first media in cryptospace to give structured information about Tron innovations! Two successful Chinese crypto-entrepreneurs almost the entire first quarter of 2019 were setting the tone for the market. 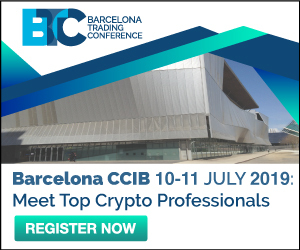 CEO of the Binance CZ was promoting IEO, a replacement for last year’s failed ICO format. And with a great success. Exchanges- imitators rushed in a crowd behind him. As well as behind his idea of instant tokensale with a lottery. The result is impressive, growing in 3 months more than 3x. The CEO of the TRON platform Justin Sun just overloaded the media with verbal interventions. His actual successes were modest. But it seems that now he will come out of this smelling like a rose! Why did Sun change the target? Probably because too many projects try to make quick money on entertainment. Universal platform, of course – more troublesome. But the competition is much less. In fact, it is enough to surpass EOS and Ethereum only. Only! Strangely enough, lately Tron in this direction advanced strongly. 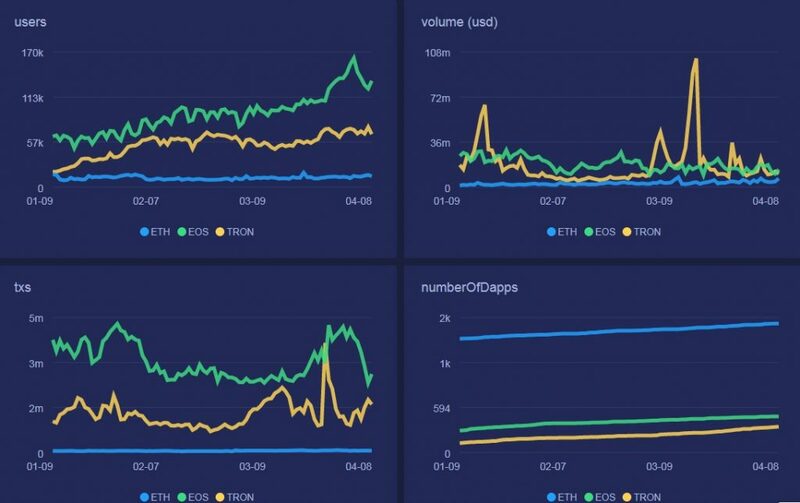 The Dapp Review resource (https://analytics.dapp.review) provides an impressive picture of Tron’s success against the background of a noticeable stagnation of ETH and not so confident progress of EOS, mainly due to past achievements. 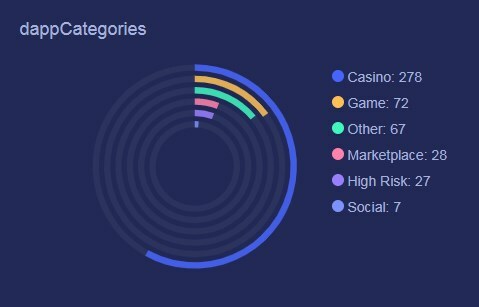 According to the Dapp Review, for 90 days the turnover of dApps on the Tron blockchain was $ 1.6 billion. Peak achievement, for example, on one day on March 15, for Tron is $ 102 M, for EOS – $ 16 M, for Ethereum – $ 4 M. However, in the community it is widely believed that the majority of accounts on the Tron network are fake. That’s why Dapp Review makes a forecast in favor of Ethereum. But Justin Sun would not be Justin Sun if he accepted the negative evaluation. Recently he came up with another verbal intervention on the grand breakthrough in the Tron blockchain, which will happen in the next six months. Half a year is a long time for a crypto. Why did he perform this right now? That’s simple. With the current level of volatility, any news can affect ratings. And it influenced – very positively. Tron needs some positive to build on the success after Bitcoin’s pump. TRX instantly added 10%, just for news about something that will only happen soon. So what did Justin Sun promise? 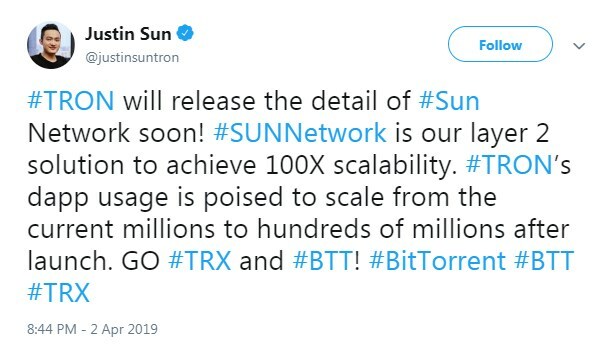 Neither more nor less – a network named after himself, SUN Network! It will be Tron’s upgrade. According to Justin Sun, his blockchain after that will improve in terms of transaction speed and the effectiveness of smart contracts. But these are just flowers. And here are berries. – TRXMarket is the first decentralized exchange based on TRON network in the world. 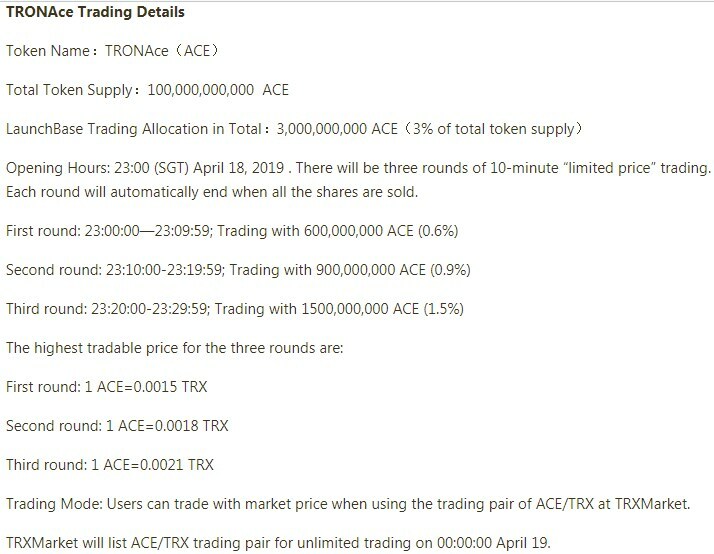 – TRXMarket has decided to launch the first high-quality project TRONAce through LaunchBase at 23:00 April 18th, 2019 (SGT – UTC+8) through selected token launch platform. – To obtain trading credit, deposit at least 5000 TRX to TRXMarket contract addresses prior to the trading. Deposit Time: 22:00 April 15 – 22:00 April 17, 2019 (SGT – UTC+8). Attention! We do not give financial advice! And the author of this review does not own TRX tokens. Previous Entry Who Procures Bitcoin (BTC)? Next Entry JP Morgan, Mitsubishi UFJ Financial Group – what bank will launch stablecoin next?